CBS is the most watched network in America, but if you try to tune in from other countries, you’ll find that the content is geo-restricted. To use CBS All Access in Europe, the UK, Canada, Australia, or anywhere else in the world, you’ll have to connect to a Virtual Private Network (VPN). VPNs encrypt your data and enable you to route it through a server of your choosing. This greatly increases your online security, but there are other benefits too. Because you’re assigned a temporary IP address from your chosen server, you can trick websites into believing you’re in a different location. For example, by connecting to an American server, you can unblock most US-based streaming platforms, including CBS All Access. ExpressVPN Our #1 pick. Operates hundreds of superfast servers throughout the US that can unblock CBS All Access with ease from almost anywhere. Solid privacy and security. Includes 30-day money back guarantee. NordVPN Budget provider with a large server representation in the US. Good streaming speeds and takes privacy seriously. CyberGhost Low-cost alternative with servers that are fast enough for HD streaming. Apps are easy to use and secure. IPVanish Prefered by Kodi users for their remote-control friendly apps. Fast and secure. PrivateVPN New and upcoming provider with excellent unblocking abilities. Fewer servers than others, but makes up for it with speed. ExpressVPN has 32 US servers, across 20 locations. This makes it easy to watch regional coverage from all over the country. Plus, thanks to its high speeds, you can experience flawless HD live streams. Additionally, ExpressVPN can unblock a host of popular streaming platforms including Amazon Prime Video, Netflix, and Hulu. This service keeps your traffic secure using 256-bit encryption, perfect forward secrecy, and DNS leak protection. You can use the Tor-accessible version of the site and pay in bitcoin should you wish to remain anonymous. ExpressVPN doesn’t keep any logs and includes a kill switch which drops your internet connection in case the VPN connection is lost. ExpressVPN offers apps for Windows, MacOS, Linux, Android, and iOS. Manual installation is required for various wireless routers. The Best VPN for CBS All Access:ExpressVPN is our #1 Choice. A blazing fast and reliable choice. Great at unblocking all major geo-restricted streaming services. Top privacy features and keeps no logs. Try it risk-free with the 30-day money back guarantee. With almost 1,700 US servers, NordVPN offers more choice than most similar services. Each of these servers is optimized for high-definition streaming, and as this VPN can unblock popular platforms like Netflix, NBC, and Hulu, your choices are almost limitless. Six simultaneous connections are permitted, so you can protect all of your devices with a single account. NordVPN offers anti-malware and ad-blocking features, as well as a highly versatile kill switch. It features 256-bit AES encryption, DNS protection, and keeps no logs, making it a strong choice for privacy-focused users. Additionally, advanced users have the ability to use two VPNs at once, or connect to Tor over VPN. This provider has apps for iOS, Android, MacOS, and Windows. NordVPN also works with Linux-based platforms and some routers, although it must be manually configured. BEST BUDGET VPN:NordVPN is a good value choice. A great value option which works reliably with CBS All Access and most popular streaming sites. Connects up to 6 devices simultaneously. App doesn’t offer server switching choice. 30-day money back guarantee. CyberGhost works differently to most VPNs; while you can manually choose a server, you can also pick one that’s suited to a particular task. These tasks include safely browsing the internet, torrenting anonymously, and unblocking streaming services such as CBS All Access, NBC, and SKY GO. Despite its novice-friendly interface, CyberGhost includes several security features for more advanced users. For instance, there are options to force HTTPS, block ads and malware, or cut traffic when the connection to the VPN is dropped. This provider uses 256-bit encryption, keeps no activity logs, and protects against DNS, IPv6, and port forwarding leaks. Android, iOS, Windows, and MacOS apps are available. CyberGhost can be manually installed on Linux systems and a selection of supported routers. IPVanish has risen to popularity thanks to its high speeds and ease of use. It has more than 650 US servers, and its speeds are fast enough to stream live, HD content without any buffering. IPVanish is capable of unblocking several popular platforms including CBS All Access, NBC, and CW TV, making it a strong choice for fans of US programming. With 256-bit encryption and a no-logs policy, IPVanish keeps your online activities private. Users can avail themselves of the kill switch, IP switching, traffic obfuscation, and local blocking features, to increase their security even further. Five connections are allowed at once, so one IPVanish account can lock down all of your home’s devices. There are IPVanish apps for Android, iOS, Amazon Fire TV, Windows, and MacOS. Manual configuration is required for Linux devices and supported network routers. LARGE NETWORK:IPVanish is great for families that need multiple simultaneous connections. Good at unblocking most geo-restricted content. Recommend for their high standard of privacy. Could do with a live support option. 7-day money back guarantee. Despite having a smaller server network than some of its rivals (just ten in the US), PrivateVPN is fast enough to stream live HD video with no problems. It excels at unblocking streaming platforms too, so you can use it to access sites like Amazon Prime Video, Yahoo View, and Netflix. PrivateVPN uses 256-bit AES encryption coupled with DNS and IPv6 leak protection to keep your traffic private at all times. There’s also a kill switch to help protect users with inconsistent internet connections. This service doesn’t log any details of your activities. Support is available 24/7 via live chat and the staff are capable of remotely troubleshooting any issues, with your permission. This VPN offers dedicated apps for MacOS, iOS, Windows, and Android. Linux systems and routers must be configured manually. 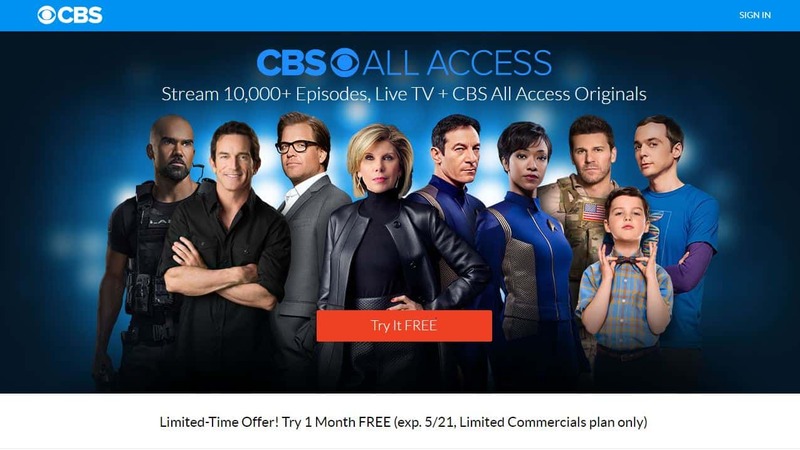 Can I use a free VPN to watch CBS All Access? While there are hundreds of free VPNs available, we strongly advise against their use. First of all, free VPNS often provide a substandard experience because they have fewer servers and yet more users than premium services. Second, streaming sites have been cracking down on VPN usage in recent years, so there’s a good chance that a free VPN wouldn’t work, even assuming you had a decent download speed. It’s easy to forget that free VPNs are businesses. Despite their rhetoric about protecting privacy, they exist to make money. As there are no upfront fees, free VPNs use several different ways to profit from you. Their money-making methods range from putting ads onto the sites you visit to selling details of your activities to third parties without your knowledge. There are good reasons to be skeptical: in recent years, we’ve seen free VPNS knowingly install malware, lie about their encryption protocols, and even turn their users’ computers into part of a botnet. In order to keep yourself and your personal information safe, we recommend using a trusted VPN with a history of protecting its users’ privacy. Can I make a CBS All Access account from outside the US? There are two ways to sign into CBS: using your cable provider’s details, or using a CBS All Access account. If you usually reside inside the US and your cable subscription includes CBS, you can watch online for free. However, if you’re not a US resident, things get a lot more difficult. 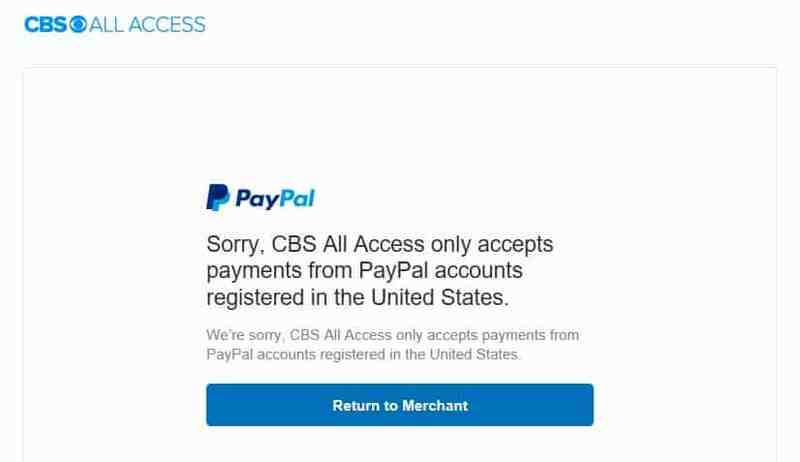 While CBS accepts various payment methods, it checks to see if the card or PayPal account you use is registered in the US. 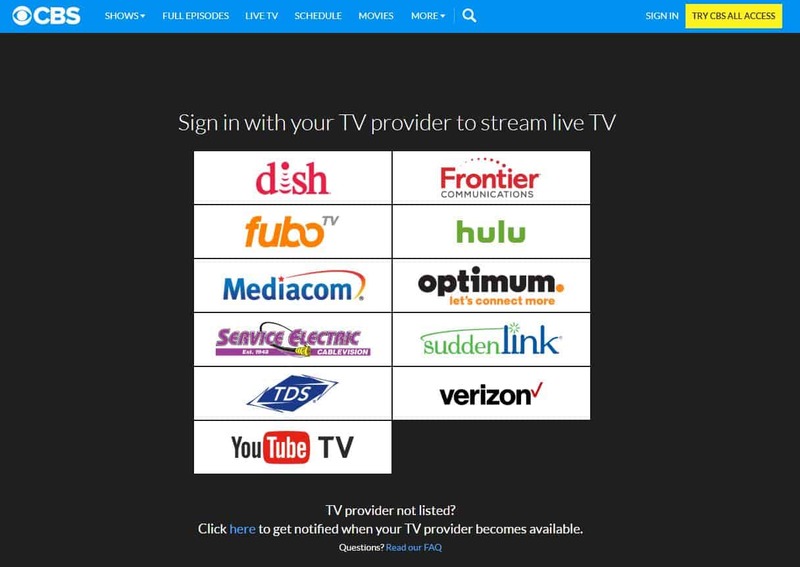 Further, even if you manage to sign up to one of the supported cable providers like Hulu or YouTube TV, the CBS site checks your location via the browser. This type of verification often considers more than just your IP address, and can potentially tell if you’re using a VPN or not. Currently, if you live outside of the US, you’ll need an American friend or relative willing to share their login details with you. Otherwise, the stacked verification methods make it all but impossible to watch CBS from abroad. What can I watch on CBS All Access?